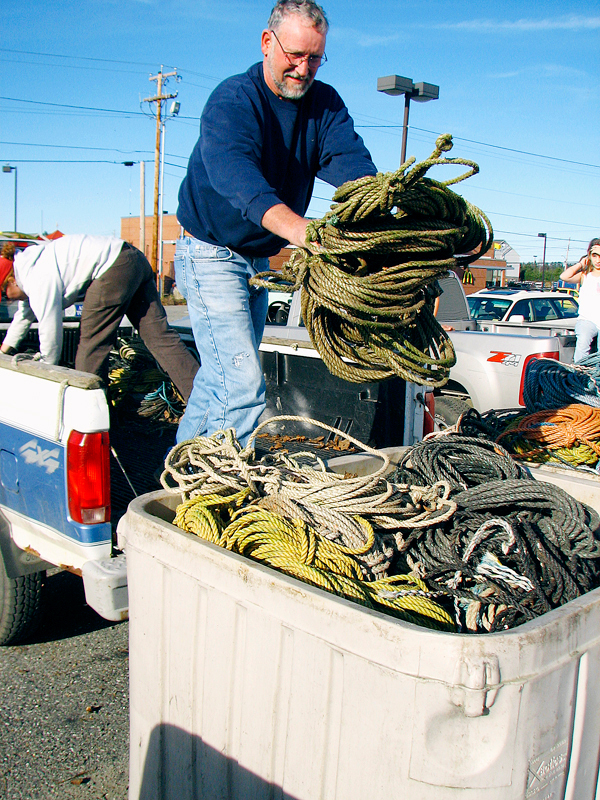 ELLSWORTH, Maine — What do you do with 180,000 pounds of unwanted rope? Most people never have to ponder this question, but for 150 lobster fishermen, the answer brought them to Ellsworth for two days last week as they traded in old floating rope for vouchers they can use to buy new whale-safe lines. Though the new federal rule requiring lobstermen to use sinking rope on their multitrap trawl ground lines went into effect seven months ago, many still are trading in floating rope for the vouchers. Last Wednesday and Thursday, 150 fishermen, most from Hancock and Washington counties, arrived at a former auto dealership on High Street with the beds of their pickup trucks — and some towing trailers behind — piled high with used float rope. Officials with the Gulf of Maine Lobster Foundation, who are operating the 4-year-old program with the help of federal grants, estimate they collected 180,000 pounds of float rope over the two-day period. “We collected 100,000 pounds of rope on the first day, which is an ungodly amount of rope,” Laura Ludwig, the foundation’s project manager, said Friday. Patten White, president of foundation’s board of directors, said all of the rope would be reused. Products made from the old rope include plastic pots, doormats and dog toys, he said. Some fishermen have been able to avoid the new rope rule by setting their gear inside an exemption line that runs approximately three miles offshore or by avoiding ground lines altogether. The sink rope rule applies only to ground lines on multitrap trawls. Fishermen who fish singles, or only one trap per buoy, still can use float rope on gear they set outside the exemption line. Federal regulators imposed the new rule in order to reduce the threat of entanglement to endangered whales. Many fishermen want to minimize their use of sinking rope because it is more expensive than float rope. The cost of switching their gear over from float rope to sink rope has been challenging in a year that has seen the price of lobster drop as the economy has gone into a steep decline. Other expenses such as fuel and bait have remained relatively high as the price of lobster has remained low. Norman Gray of Seal Harbor said Wednesday he was trading in about 300 pounds of float rope. He said he hasn’t used sink rope yet because he has been fishing singles. “Next year, I’ll probably try it,” he said. Gray said the price he has been getting for his catch has been a little over $3 a pound. Brent Jones, 61, of Deer Isle, said the price he has been getting is “lousy.” At $2.90 a pound, Jones is earning a few dimes more per pound than what many fishermen were being paid a year ago, but it’s still about $1.50 less per pound than the average annual statewide price that fishermen earned for their catch in 2007. Jones said it costs him $500 to $600 a day just to go out fishing. That includes the cost of fuel, bait and wages he pays a sternman to help him at sea. Jones said the use of sink rope, which wears out faster than float rope, has done more than just add to the cost of fishing. It has added to his workload, too, because it has to be replaced more often. The foundation has another exchange planned for Dec. 9 and 10 in Waldoboro. Any fisherman who wants to bring rope to that exchange should register by contacting the foundation at 985-8088.